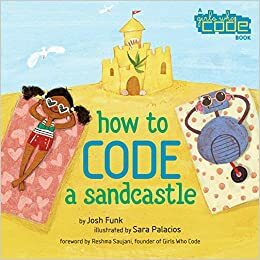 How to Code a Sandcastle, written by Josh Funk and illustrated by Sara Palacios, is a silly take on a serious subject – the lack of women, especially minority women, in coding. The text begins with a foreword by Reshma Saujani, the founder of Girls Who Code. Saujani suggests that coding should be “a familiar part of every child’s world.” Funk’s book certainly contributes to this project. Pearl, the pigtailed russet-brown protagonist and narrator, makes core concepts in coding engaging and accessible for even very young audiences. We’re introduced to Pearl on a bright sunny beach and quickly learn it is the last day of her vacation. Pearl is committed to building a sandcastle. Frisbees, surfers, and peeing pugs have stopped previous attempts, but not today! Pascal, Pearls’ “rust-proof robot,” is her secret weapon. She’s going to supply the code and he’s going to build the sandcastle. Funk does a great job clearly explaining the logic of coding: “… a coder takes one big problem and breaks it into several smaller ones.” Throughout the text, that is exactly what Pearl does. The story moves through several silly scenarios prompted by Pearl’s coding errors. First, she’s not specific enough when asking Pascal to find an area to build a castle and he ends up in places that just won’t work, first the ocean and then a parking lot. But, the clever Pearl troubleshoots and solves the problem by clarifying the code. We learn codes need to be extremely specific. We also learn about looping, which leads to another giggle-inducing mishap. When an action needs repeated you can use a loop, but it’s important to make sure the action stops. Pearl is bored manually repeating a code asking Pascal to bring sand to their building location, so she puts the command on a loop. But, she ends up with way more sand than needed. The silliness and problem solving repeat themselves until, finally, they have a sandcastle! The text could end here, but Funk throws in a couple more lessons and laughs. Pearl’s bad luck with sandcastles continues when the high tide washes her creation away. Never discouraged, the quick-thinking Pearl realizes she can easily reuse the already written code and add a moat digging code to save the sandcastle from unruly ocean waves. It works! Proud and heartened by her success Pearl decides to build a kingdom of sandcastles. The text ends with Pascal, Pearl, and her dog sitting on the beach as the sun sets, relaxing after an accomplished day of sandcastle kingdom building. This is a very fun book. Bright illustrations and clear prose help maintain a sense of excitement and possibility throughout. My three-year-old giggled his way through the book and was able to explain coding after we read it a couple of times. This is a text I can read to him now, and that he can read to me in a couple of years. I highly recommend this book and will surely be gifting it to some young girls in my life this holiday season.